Thanks to the exclusive Thomas Nelson NKJV Comfort Print® typeface in the largest format available—super giant print—your eyes will discover a smooth reading experience allowing deeper engagement in God’s Word. But with the NKJV Super Giant Print Deluxe Reference Bible, you won’t have to sacrifice study features for readability. A complete cross-reference system, book introductions, a concordance, and full-color maps make this the go-to Bible you’ll look forward to reading. 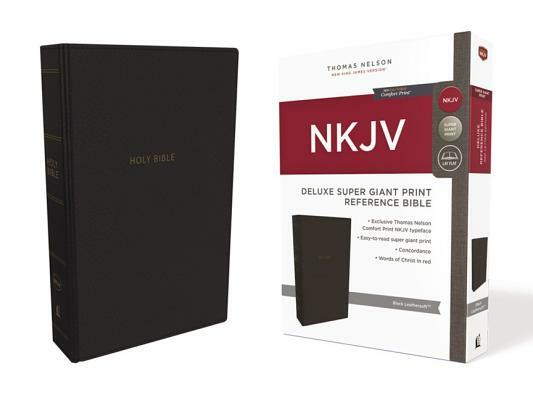 NKJV, Deluxe Reference Bible, Super Giant Print, Leathersoft, Black, Red Letter Edition, Comfort Print by Thomas Nelson was published by Thomas Nelson in June 2018 and is our 10408th best seller. The ISBN for NKJV, Deluxe Reference Bible, Super Giant Print, Leathersoft, Black, Red Letter Edition, Comfort Print is 9780785218036. Be the first to review NKJV, Deluxe Reference Bible, Super Giant Print, Leathersoft, Black, Red Letter Edition, Comfort Print! Got a question? No problem! Just click here to ask us about NKJV, Deluxe Reference Bible, Super Giant Print, Leathersoft, Black, Red Letter Edition, Comfort Print.